This is a very popular establishment for both locals and tourist, and easily one of the best restaurants in Moncton. It is conveniently located just off of historic Main Street which has ample parking one block away. Every time we’ve been there has been a bit of a lineup for a table. Don’t be discouraged, it typically moves pretty fast so you won’t gave to wait long. In the summer, they do have a patio that offers almost double the amount of seating. It can be a great place to enjoy a cold beer on a warm summer night. However, the additional seating can mean you wait a little longer for beer or food. This is a child friendly establishment, which can be a huge plus. In our experience most brewpubs don’t allow kids, so this is great for those travelling with children. 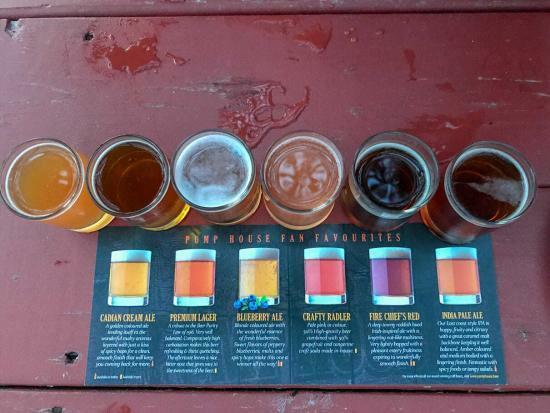 Several of the Pump House Brewery beers have won awards throughout the years. One of our favorites is the Blueberry Ale. The delicious golden ale gets its blueberry flavor from local New Brunswick blueberries, which are a sweeter, smaller version of most you will find. Recently, they have added the Crafty Radler to their brews. For those that don’t really like beer, this is for you. It is a mix of 50% beer with 50% tangerine and grapefruit craft soda that they make in-house. It is very good and really tastes more like kombucha than beer. During the summer months, order the 32 oz beer. These big boys come out chilled, and can help when the patio is open and the beers take a few more minutes to come out. They are also a great value at $10. Unsure which beer to get? Get on of their samplers, then order a 32 oz mug of your favorite. Thought the beer is what they are best known for, their food is good as well. They offer a pretty good variety of pub foods and many kinds of burger, sandwiches, salads. We recommend their wood fired pizzas! 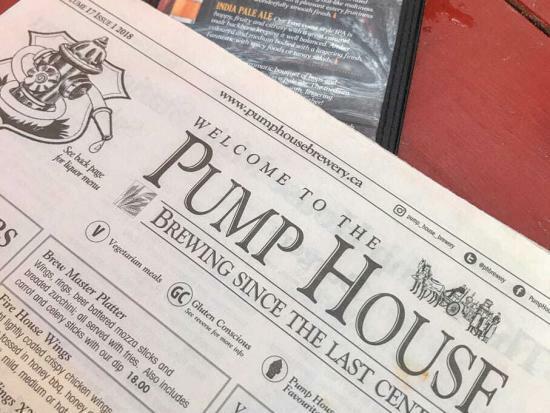 The Pumphouse Brewery offers several classic options, a daily special that is an original creation, or build your own. We typically opt for the mussels to start and then order a pizza or two depending on hunger levels and a few beers, of course! If you are looking to try something that is very local, order the garlic fingers. It is a pizza crust with garlic butter and a good helping of cheese. Basically, it’s a garlic sauce pizza with no toppings except bacon bits. What is really local about this? Well, it comes with donair sauce for dipping. We know! We don’t really get it either, but try it and judge for yourself. In case you were wondering, The Pump House Brewery is not in an old fire house. 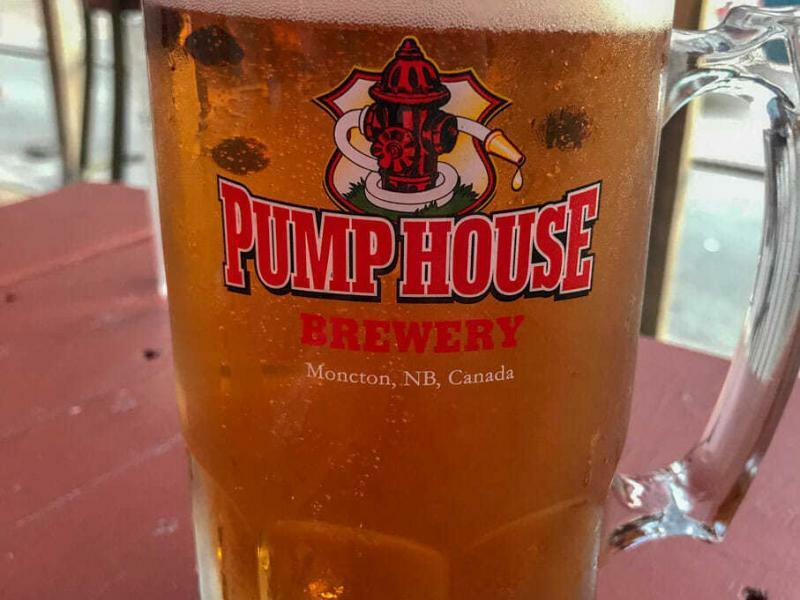 The name Pump House comes from the owner being a retired fire fighter from the Moncton Fire Department.